Have you been trying to pinpoint your personal decorating style? Or are you having a hard time parting with some of your favorite traditional pieces to move toward a trendy modern and contemporary look? Not to worry! It’s perfectly acceptable these days to mix and blend traditional and contemporary styles. You may have been doing it all along and just didn’t realize it had a name. This design style is referred to as Transitional. Transitional design is a mix of traditional styles with contemporary and modern. You can enjoy the detail and peaceful familiarity of your traditional style pieces, along with the clean and simple lines of a more modern and contemporary look. Here are some guidelines to use as you’re planning your transitional home design. Color is an important starting place for a transitional look. Neutral shades make a stunning showcase for your traditional pieces. Try a warm neutral, such as cream, taupe or vanilla. The color you choose needs to have a restful feel to it. A bit of chocolate brown looks beautiful as an accent to the calming neutrals. If you feel like you need to add something bright, do that with a splash of color on a pillow or even a lampshade. If you have a traditional piece of furniture that has an abundance of curves, complement it with a piece that has straight lines. The key is to balance one with the other. Textures are a wonderful way to incorporate interest and beauty to your new style. Textures are accentuated by the neutrals and can become a focal point of your room. Rugs, throws, and pillows are a good way to showcase various textures and textiles, but don’t forget some of the beautiful textures of furniture. A corduroy sofa, beautiful soft leathers or even a chenille chair will make your area more interesting and inviting. Transitional style is not limited to living rooms. 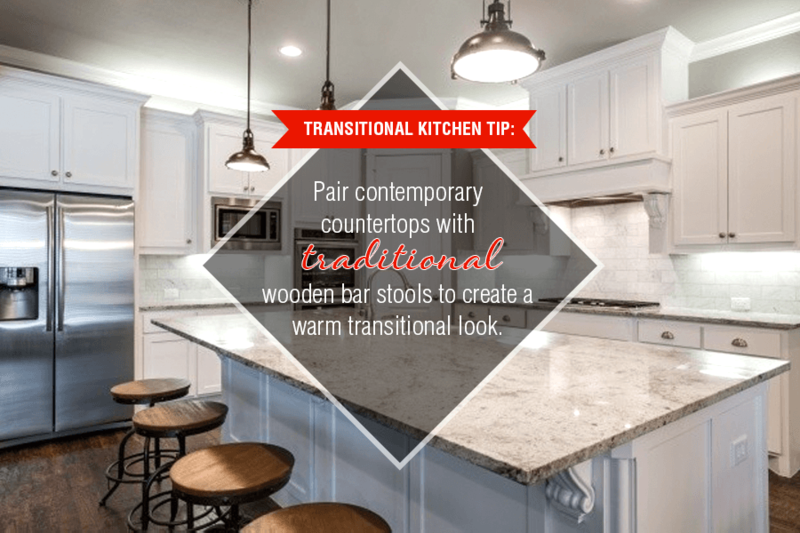 A transitional style kitchen and dining room can blend modern and contemporary countertops in the kitchen with more traditional woods in your dining table or bar stools. Your bathroom is another great room to show your new transitional style. Using a neutral color for your walls, add dimension with a traditional cabinet or wooden bench. Textural rugs can be just the right touch to tie all of your elements together. The best of both worlds can be found in transitional design. Showcase your traditional side and blend it with contemporary and modern lines to create a home that is a soothing and calming respite from your busy life. Whether you need paint, new floors, or a full remodel, DFW Improved can update your home with a beautiful transitional look. Click here to request a free estimate on your project.